It took two players hitting two homers a piece and six shutout innings from the BJ bullpen for Liberal to finally end what was beginning to feel like a Haysville hex. 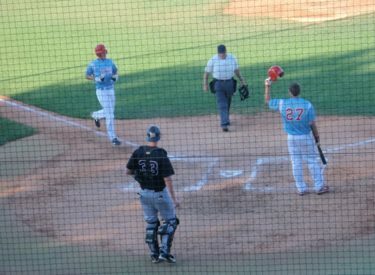 The BJ’s beat the Heat 8-2 Saturday night at Brent Gould Field for the first time after four straight losses to the Jayhawk League leaders. With his parents looking on from Houma, Louisiana, Blake Bergeron hit a two run homer in the first and a solo shot in the third. College of Sequoias third baseman Joe Perez led off the second and sixth innings with homers. Both sluggers have a team leading five a piece now this season. Rhode Island’s Kyle Borded added a 3-4 night with a double at the plate. As impressive as the BJ’s offensive onslaught was, the BJ arms came to rescue as well. Arkansas lefty Christian Kowalchuk pitched the first four innings striking out four and allowing two runs. Another former Saint Clemson’s Tomas Cruz pitched three scoreless innings weeks after pitching for the Tigers at the College World Series. Cruz struck out four and earned the win in his BJ debut. San Diego’s Nick Youpel pitched a scoreless eighth meaning he hasn’t allowed a run in nine and one-third innings pitched. Lamar’s Brandon Ward-Hersee pitched a scoreless ninth. Liberal jumped off to a 5-0 lead scoring two in the first, one in the second, and two more in the third. Liberal added a run in the sixth and two more in the eighth in the win. Haysville scored two in the fourth and loaded the bases with one out but Kowalchuk induced a fly out to right and picked a runner off first to get out of Liberal’s only jam of the night. The BJ’s have won nine of their last 10 and are 18-7 overall and 10-7 in the Jayhawk. The Heat cool to 20-7 overall and 16-6 in the Jayhawk. The same two teams meet Sunday night at 7 p.m. on Brent Gould Field. Windtree Management is the buyout sponsor.